Sleep Number ComfortFit Pillow Review, How does it rate? The Sleep Number ComfortFitTM pillow is one of many Sleep Number products, all designed with the intention of providing customers as comfortable a night’s sleep as possible. The ComfortFit is a combination of memory foam and the feel of down—in this case, a down alternative, so it’s hypoallergenic. The combination is intended to to hold its shape as well as provide luxurious comfort. The lyocell cover breathes freely and comfortably. 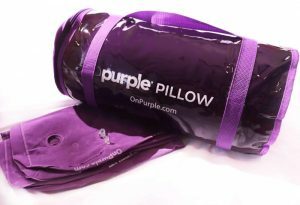 The pillow comes in two kinds, both covered by a 5-year limited warranty. The Classic Pillow supports both the neck and head. The Curved Pillow also cradles the shoulders for additional support. The Sleep Number bed is a generally well-regarded bed designed to provide individualized comfort for the sleeper(s). J. D. Power ranked their mattresses the highest in customer satisfaction for both 2015 and 2016. The company focuses on the idea that “one size does not fit all”—or, perhaps more appropriately, “one firmness does not fit all.” Simmons/Beautyrest and Tempurpedic came in close behind, but all three were well above the fourth, IKEA. Unlike many other mattress manufacturers, Sleep Number products are available only through their stores (or online). They have over 500 stores around the United States, and most seem to be along Interstate corridors. The mattresses generally connect with their SleepIQTM technology, which allows you to track your sleep nightly. You’ll get all sorts of information, from your average heart rate to the time in deep sleep. The mattresses generally can be set to a wide range of firmness levels, and the larger mattresses have two zones. These zones allow you and your partner to have different levels of firmness, and therefore different SleepIQTM. Memory foam, developed by NASA in the 60s, is designed to yield when under pressure, and resume its shape when the pressure is removed. In pillows, it should end up cradling your head and neck to keep the bones in good alignment, allowing a good night’s sleep. Memory foam is not very breathable, but many manufacturers will construct their pillow with cells, allowing for a cooler sleep. One thing to note about memory foam products is “off-gassing”. On opening the package, a smell will be present, but it will dissipate after a day or so. Memory foam is fairly neutral when it comes to snoring. In addition to the mattresses, Sleep Number sells a broad range of products. All their items are pricey, but they seem to have frequent 20% off sales. And shipping on bedding is always free. In addition to pillows, you can get sheets, mattress pads and layers, head- and foot-boards, and other bed accessories. Their bases are designed to work with the mattresses. While the mattresses fit on standard frames, the Sleep Number bases can provide head-raising to help with your partner’s snoring, foot warming to assist with falling asleep, and under-bed lighting to prevent you from tripping when you get out of bed. As many merchants are doing, Sleep Number includes product reviews from customers. The company seems responsive to these reviews. One thing I commend them for doing is including negative reviews on their own website. Now, I know you must take these reviews with a pinch of salt—I wouldn’t claim that they’re a representative sample. But as of this writing, 124 reviews exist for the ComfortFitTM pillows, and 88 of them award a score of 5—the highest, while 10 come in at a 1. They have responded to several of the lower ratings. The pattern for the low ratings seems to be the pillows tend to get flat. The general positivism for the pillows is in line with the solid ratings for most of their products. While the mattresses are their focal products, they appear to be providing significant customer support for all their products, usually with an invitation to call to discuss any concerns over the phone. This strikes me as an efficient manner to do business. Pillows are an individual thing, and one person’s concern might be another’s wonderful night’s sleep. My wife’s first words after sleeping on this pillow were, “I’m feeling good this morning.” She felt refreshed and cheery after sleeping on it. She told me she liked it right away. She’s very relaxed and happy after using the pillow. She used the Curved Pillow, which helped support the head, neck, and shoulders. She felt strong support, and no matter how she turned, she found herself in a comfortable position. My first thought when picking up this pillow was, “This is beautiful.” This pillow’s quilted design will fit in with any interior decorating plan you have. Guests will feel right at home with these pillows on their beds. Compared to most performance pillows, it’s a superior in design, feel, and aesthetics. The textured feel will make your guests enjoy a 5-star hotel experience in your home. It is a heavy pillow, but that heaviness is typical of memory foam or down alternative pillows—and this one has both. At first, I found it very comfortable to lie on, but through the night, I woke several times. It seemed the pillow was too firm for me. It’s also a bit thicker than I usually like. One thing I noticed is that it does not stay cool. If you sleep warm to hot, this is not the pillow for you. It has no special cooling technology. The curved version did not do much for me. While, as noted, my wife liked it, I felt it added extra bulk. Since I like thinner and softer pillows, this is a major strike against it, in my opinion. There are similar pillows which provide better features. Bedgear, for example, makes pillows with a similar fill to this SleepNumber one. The Bedgear also includes cooling technology, and the price is about the same. This is a good pillow. I would wait for SleepNumber to have a sale, however—they frequently offer discounts of 20%. If you are a fan of the company and its products, you will love this. 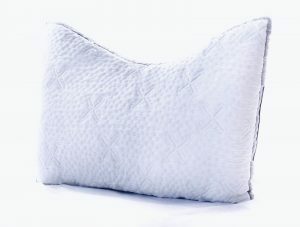 If you are looking for a solid pillow which will look great in your bedrooms, this pillow is clearly for you—it’s one of the best-looking ones I’ve seen.